CurveFitter program performs statistical regression analysis to estimate the values of parameters for linear, multivariate, polynomial, exponential and nonlinear functions. The regression analysis determines the values of the parameters that cause the function to best fit the observed data that you provide. This process is also called curve fitting.Any user-defined equations of up to nine parameters and eight variables. 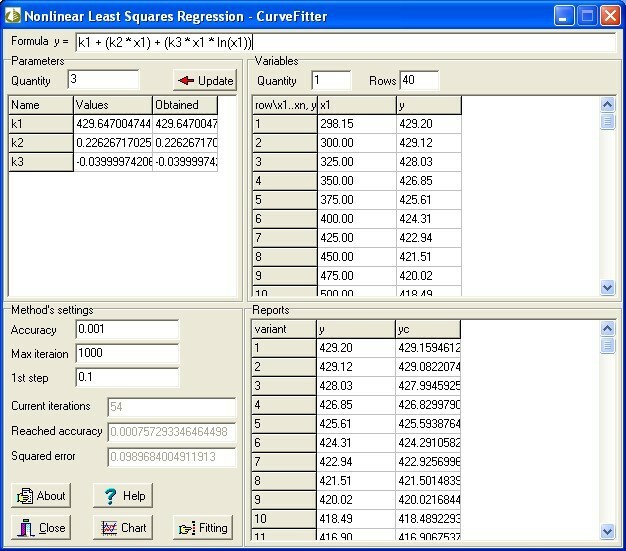 Qweas is providing links to Nonlinear Regression Analysis - CurveFitter 4.5.4 as a courtesy, and makes no representations regarding Nonlinear Regression Analysis - CurveFitter or any other applications or any information related thereto. Any questions, complaints or claims regarding this application Nonlinear Regression Analysis - CurveFitter 4.5.4 must be directed to the appropriate software vendor. You may click the publisher link of Nonlinear Regression Analysis - CurveFitter on the top of this page to get more details about the vendor.